Artist Anthony G. Tasset created this sculpture. The piece of art is composed of three sculptures made of polyurethane and is covered with fiberglass. The artwork is displayed in the west courtyard of the Institute for Genomic Biology. 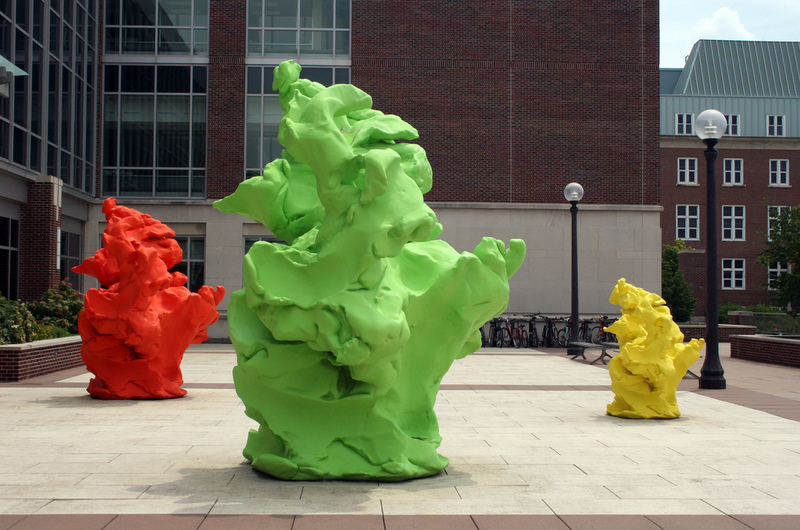 Originally called "the blobs" by Chicago-artist and creator Tony Tasset, the colorful sculptures now known as Darwin's Playground have become well-known on the University of Illinois at Urbana-Champaign campus. Darwin's Playground is an abstract rendition by Tasset that shows the role modern biologists play in shaping and even creating life, and demonstrates how life sciences are ever-changing and advancing. The colorful shapes capture the child-like creativity of biologists as well as the malleability of life forms through genetic engineering. Housed on the plaza in front of the main entrance to the laboratory at the Institute for Genomic Biology, the three sculptures range in height from six to 12 feet and were dedicated in September 2007. With the 12-foot green structure weighing 3,000 pounds, to the 10-foot orange-red (which the artist wanted to paint pink) weighing 1,400 pounds, to the six-foot 600 pound yellow object, the three are anchored to the plaza and appear to be floating. The brightly painted figures are constructed of polyurethane and covered with fiberglass. The sculptures were manufactured by Johnson Atelier in Mercerville, New Jersey. Designed by Tasset, an award winning artist, faculty member at the University of Illinois at Chicago and a Guggenheim Fellow based in Chicago, the original creations convey the spirit of IGB and promote its mission–to advance life science research and to stimulate bio-economic development in Illinois. With more than a year of planning, design, and fabrication, a seven member committee oversaw the selection of an artist and commissioned the work which was funded by the Illinois Capital Development Board's Art-in-Architecture Program. As part of the parameters, the artwork needed to be created by an artist living and working in the state of Illinois. Today, the artwork plays a role in helping to define the Institute's identity both locally and nationally and is enjoyed by visitors across the country and the world. 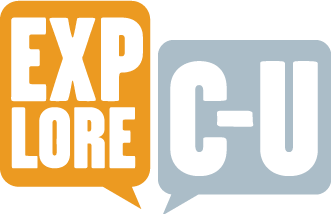 Institute for Genomic Biology, “Darwin's Playground, dedicated 2007,” ExploreCU, accessed April 21, 2019, https://explorecu.org/items/show/62.